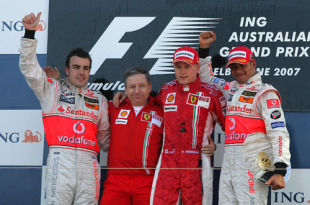 Kimi Raikkonen helped Ferrari to make a seamless transition from the Michael Schumacher era by winning his first race for the famous Italian marquee. Starting from pole position, the Finn dominated the race, only making one tiny slip when he ran wide over a kerb. Apart from that it was a flawless display although post-race it was discovered that his car had developed a water leak, but it never affected his pace. Raikkonen had the edge over his McLaren replacement Fernando Alonso who finished second on his debut for the team - but the drive of the race came from British novice Lewis Hamilton. In the second McLaren, Hamilton started from fourth on the grid and the reigning GP2 champion led for three laps during the pit stops in the most impressive rookie display for many years. Hamilton could have finished second but he was held up on his in-lap to the pits by the Super Aguri of Takuma Sato, costing him enough time to cause him to drop back behind Alonso. Nick Heidfeld (BMW-Sauber) took fourth from Giancarlo Fisichella's Renault, while Felipe Massa took sixth, having started last on the grid. A gearbox problem destroyed his qualifying but he drove a fabulous race to score two championship points. Rather overshadowed by Hamilton's debut was that of Heikki Kovalainen who finished 10th for Renault and Adrian Sutil who was last in the Spyker-Ferrari.